Large minute hands usually have a “tail” for balancing, but that length is not included in the measurement of the minute hand. People often include the length of the “tail” and measure the overall length of the minute hand. This is not correct. Just measure from the middle of the mounting hole to the tip to get the correct length of your minute hand. All of our large hands 8 inches or longer are “balanced”. They have a “tail” or counterweight on the back side. If you were to place the mounting hole on your fingertip the minute hand would actually lay flat or “balanced” on your fingertip. If you are considering re using large hands you may have, it’s very important to check if your minute hand 8 inches or longer is actually “balanced”. It’s very important to check this. If your long minute hand is not balanced, it can cause the motor to run slowly, or possibly not at all. It’s also important to check the mounting hole sizes we show in the upper left of this page. Look closely, they are actually measured to within a tolerance of plus or minus .002 inches. You would need a micrometer or calipers to make this measurement. So please be careful here. Clock Hand mounting hole sizes simply are not standardized. It can be a pain in the neck. The hands we show for almost all of our movements use the American “I” shaft configuration. This means that the minute hand has an oblong hole with two flat sides, and is held in place with a small round nut. The hour hand is a “press-on” so the hole is round. There is even a German version of the “I” shaft. The minute hand hole size is the same as the American version. 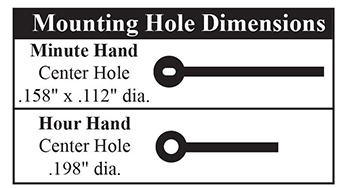 The hour hand hole size is different by a total of .004 inches smaller. Just enough that the hour hands will not be interchangeable. If you cannot take careful measurements of the mounting holes in your clock hands, then it would be best to buy new hour and minute hands when replacing the clock motor. Always buy clock hands from the movement or motor supplier so you are sure they are compatible.